A trip to our Distillery in Lawrenceburg, or to our unique single-story rack Warehouse & Bottling Facility at Cox’s Creek, will not only help you to understand how our Bourbon has come to be so mellow, but it will also give you an inside look at the rich history and legacy of Four Roses Bourbon– dating back to 1884. A number of items are currently on display at the Distillery and Warehouse & Bottling Facility visitors’ centers. Better known as Al’s Archives, named after Four Roses Senior Brand Ambassador Al Young, these items include antique bottles, vintage advertising and other memorabilia that help to tell the story of Four Roses Bourbon. Al Young has been with Four Roses for nearly 50 years, serving in a variety of roles in quality control and management. In 1990, he became Distillery Manager and in 2007 was named Four Roses Brand Ambassador, a role that has him crossing the country sharing the story of Four Roses and its Bourbon. He is also historian for the storied 127-year old Kentucky Bourbon brand, having researched archives, distillery records, news accounts, photos and artifacts in order to write the coffee-table book Four Roses: The Return of a Whiskey Legend, published in 2010. 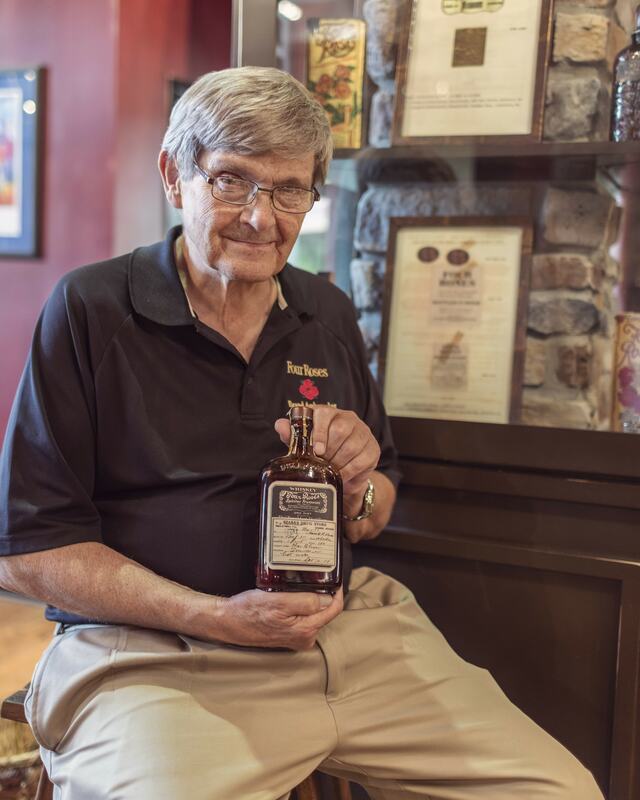 Young was recently inducted into the Whisky Magazine Hall of Fame and is also a member of the Kentucky Distillers’ Association Kentucky Bourbon Hall of Fame. We sat down with Al to get a bit more information about some of the memorabilia in the Four Roses Archives. 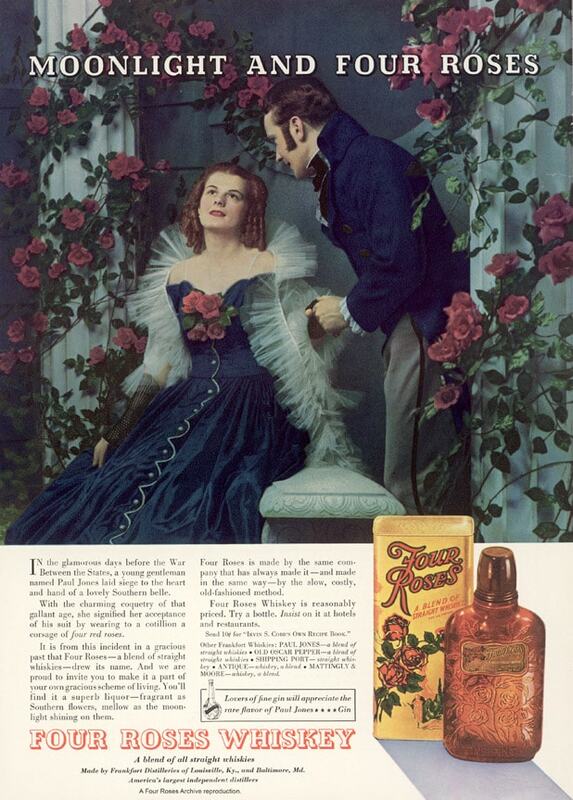 Four Roses’ original advertising collection includes printed advertisements from 1934 to the late 1970’s. Among the favorites on display are a 1937 “Moonlight and Four Roses” and a 1940 “Famous Cake of Ice,” to name a couple. 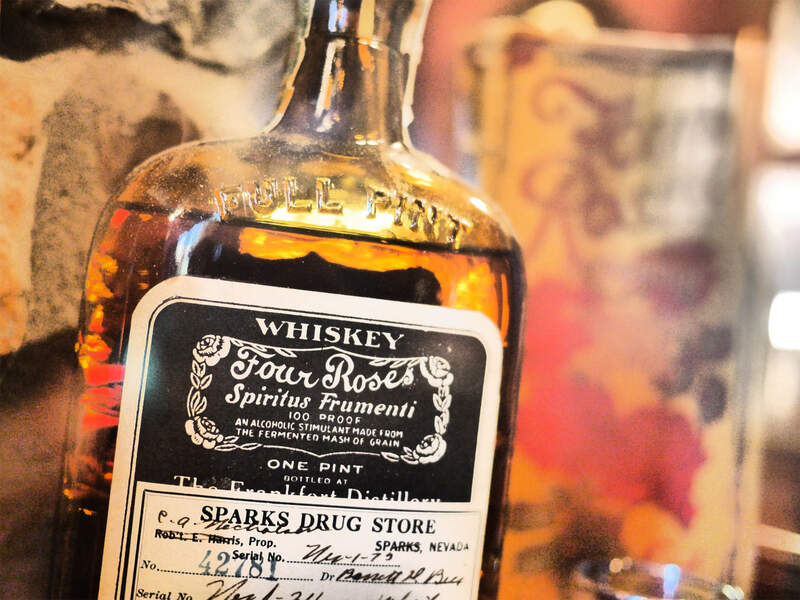 The vintage bottle collection continues to grow and features a 1919 bottle of Four Roses; a Four Roses “Spiritus Fertmenti” bottle of medicinal whiskey with the prescription still attached and some bottles from the late 1960’s, showcasing a uniquely different container concept. The Four Roses printed book as well as a pamphlet and record collection contains numerous copies of Irvin S. Cobb’s Own Recipe Book from after the repeal of prohibition, as well as old sing along and dance party tunes from the 1950s. As our collection continues to grow, we encourage all of our long-time friends to make a visit and check out a piece of Four Roses’ history.